Share the post "#BringBackPaper 2015 Challenges"
Ooh, a fresh new year of #BringBackPaper! I love, love, love this series, as I suspect you can tell. 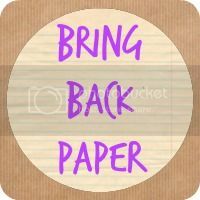 If you’re new to #BringBackPaper, I’d say the big thing that I’d like people to understand is that it’s for everyone, not just a bloggers link-up. It’s about getting more paper (pretty paper, not boring emails and bills, you understand) enjoyed. It’s about taking time to unwind with a book, make someone’s day with a letter, ‘think’ through your journal, or just have a bit of fun with some scribbles and doodles. And I do like to share and see lots of beautiful stationery, too, so that’s a real perk! This year I’ll continue to bring you papery posts every Wednesday here. Amongst other things and along with the challenges and activities mentioned below, I’ll share my stationery top picks, a whole host of posts around snail mail, chatter on about books and reading, showcase stationers and papery blogs, run paper give-aways, and I will continue to invite guest posts here, too, so do get in touch if you’d like to feature here, or have suggestions for content you’d love to read about. Read Write Create, that’s what I’m suggesting that you do, every month this year. Make time for yourself and perhaps try things you might not ordinarily do. ‘Read’. For me, that’ll always be a book (several if it’s a good month! ), but it might just be a cuppa and a magazine for you, it’s whatever you want it to be. Perhaps commit to a book a month, if that would be a challenge for you and a treat to look forward to. You could get round to reading books you’ve had on your shelves for ages. Maybe you’ve not read a book for years, so this is the year you read a little each month and finish at least one this year! Or perhaps you’ll treat yourself to a magazine subscription to look forward to every month. I’m thinking I might do that, too, now that I’ve typed it! ‘Write’. For me, this is likely to be snail mail, though I have started writing in my one-line-a-day journal that I mentioned last month, too. Throughout the year, the monthly activities may prompt me to write other things, too. You might keep a journal, start up a gratitude book, sit down and write a short story, turn your hand to poetry, or it might be thank you notes, to-do lists, mind-mapping, it’s all writing! And I do mean write with paper here, too, just to clarify – it’s all about paper! ‘Create’. For me, this is the one that’ll push me, and I’m looking forward to seeing where it leads. There’s a huge host of possibilities where paper’s concerned, and I’ve a number of ideas milling around my head already. The idea of smash books appeals to me, and I do like to doodle. You could try paper crafting, sketching, card-making, scrapbooking, there’s lots of scope within this one, and as these are all things I’ve not tried before, I’m looking forward to seeing what I can actually come up with! Each of these things, however you translate them personally for you, are about taking a little time out and enjoying the simple things. At the end of every month I do open a Papery Peep linky (always the last Wednesday of the month, open for a week), and I plan to update you on my Read Write Create activities there, along with any other papery pretties that I want to share. I will also share favourites from any that you share with me there, too. Papery Peep is a linky to share any paper you’ve been enjoying, whether it be a great book you’ve read or a new notebook that you’re loving, it’s totally up to you. You’re very welcome to update us on Read Write Create there, too, if you’re joining in and are a blogger, but you can just take part and not blog it, of course! In addition to Read Write Create, there will also be something happening each month, so I’ll give you an idea of the plans here, and then be sure to drop by on the first Wednesday of every month where full details of that month’s activities will be shared. December – I really don’t think anyone needs a papery challenge this month! I’m thinking Christmas cards, wrapping paper and thank you notes will kind of cover it! – Send out at least 1 piece of Happy Mail. Now, if you’re in #PostCircle or already have several pen pals, this will be a breeze for you, so I challenge you to send out one more, to someone that you don’t regularly correspond with. For those of you who don’t write often, then this is your time to get creative, take a few moments out and pen a note, or a letter, or a postcard. It needn’t be a long missive, it might just be you popping a little ‘pick me up’ package in the post to a friend or sending on a book that you’ve enjoyed. It doesn’t matter, it can be whatever you want, as long as it’s papery post and therefore ‘happy mail’. It’ll make someone’s day, I’m sure, so it’d be lovely to commit to doing that this month, wouldn’t it? Louise recently posted…Do you wanna build a snowman? I’m in! 🙂 Need to note it down though, in case I forget! And I’ve been forgetting a lot of stuff lately 😉 Must be my age. Haha. Super, super excited by this and can’t wait to participate in read, write, create. Oh this sounds great, really looking forward to participating 🙂 the only thing I am rubbish at is snail mail. I cannot remember the last time I did that, other than posting artwork my son has done for relatives or thank you cards. That one might be a struggle! The read, write, create prompt is ideal for me and my new scrapbook. I will be journalling and using lots of pretty paper. Count me in! My kids are kinda doing this! They have just got penpals 🙂 Well I got them for them, for them to try and improve their writing skills and to learn about other children. I’m hoping it works!